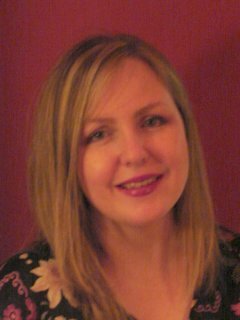 Continuing the 12 Authors of Christmas, here’s historical romance author Janet Dean! Janet’s journey toward publication took nine exciting, sometimes painful years of learning her craft and dealing with rejection. Two of her manuscripts were 2005 and 2006 Golden Heart finalists. One of those manuscripts was a 2006 ACFW Genesis finalist. Today Janet writes inspirational romances for Steeple Hill. Fascinated with history and the role of strong women in our nation’s past, Janet brings both together in her faith-based love stories. Her debut novel, Courting Miss Adelaide, Love Inspired historical will be released in September 2008. Steeple Hill recently bought her second book in the series, Distant Hearts, w/t. 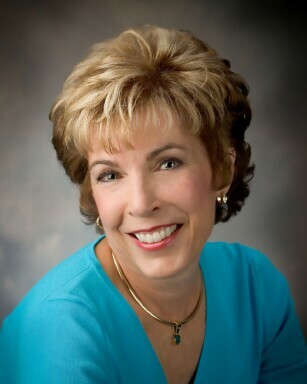 Janet is a member of American Christian Fiction Writers, Romance Writers of America, and Faith, Hope, Love. When she isn’t writing, Janet enjoys making greeting cards and playing bridge. The Deans love to travel and spend time with family. My first memory is of jumping up and down on the bed on Christmas Eve, wild with excitement that Santa was coming that night. Our family draped the Christmas tree with tinsel. My brothers wanted to toss it at the tree, but Mother insisted we hang each strand evenly from the branches and save all we could for the next year. I can still picture them swaying when the furnace kicked on. Tinsel is one tradition I’m happy to forego. ☺ Once Santa no longer bought our presents, my parents moved our opening to Christmas Eve. Years later my mother got a job and had to work on December 24. To ease her work load, she prepared spaghetti sauce the night before and a tradition was born. After dinner, the kitchen had to be cleaned up before we could open presents. I use my brother’s spicy recipe for my spaghetti sauce. My husband and I fell into traditions with our two daughters. Each night, near their bedtime, we’d light a candle on the coffee table and gather around to sing carols. The girls and I baked cut out cookies, an exercise in patience, and we drank eggnog when we decorated our tree. 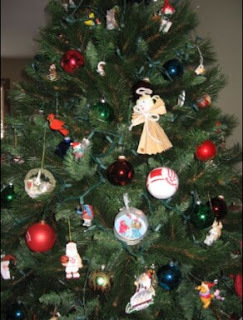 Each year we gave the girls ornaments that now decorate the trees in their homes. We continue that on Thanksgiving weekend, taking our grandchildren to the store to pick out an ornament. Our trees are artificial, but even when we put up live trees, we decorated immediately after Thanksgiving Day. The little tree in my kitchen is decorated with small gourds I painted. The lower level tree is hung with Disney characters, our daughters’ homemade decorations, wooden Santas my father carved, and ornaments from our travels. It’s a wonderful mixed bag. 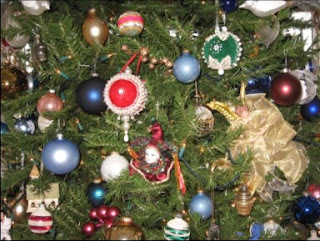 My favorite ornaments on the fancier great room tree are the Styrofoam balls my mother covered with velvet and beads in the 70s. 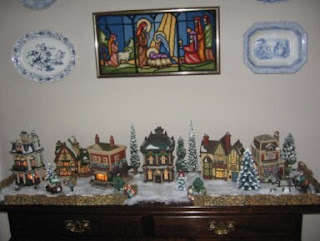 I decorate the balcony and mantle, put out our Christmas village and old Christmas post cards from my husband’s family while he sets up a train to run around the base of the tree. We have two crèches—one childproof and a three-foot resin Santa holds a tray where the grandkids leave a note, cookies and milk for Santa. 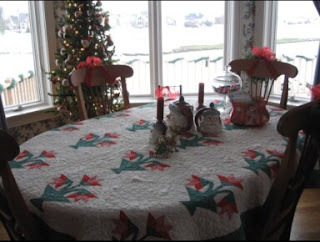 My husband’s grandmother’s red, white, and green tulip quilt dresses our kitchen table, protected with clear placemats from spills. I’m sentimental and cherish these precious reminders of family at Christmas. I’m a pew singer, not choir caliber, but I love to sing and hear all the carols and traditional songs. If I must pick a favorite, it would be Silent Night. We play Christmas CDs all month long—everything from classical to country, rock n’ roll and old standards to today’s Josh Groban and pianist Jim Brickman. The girls gave me an animated Santa that swivels his hips to “Jingle Bell Rock.” Music is a huge part of our Christmas. My brothers and I woke our parents around five Christmas morning. They often hadn’t gotten enough sleep, but they’d get up and lead us downstairs. We took turns opening gifts one at a time. The anticipation nearly killed us. We stayed in our pajamas for hours. My mother made the clothes for my new doll—always my favorite toy. We live in the Midwest so snow is certainly possible. Big flakes drifting down make Christmas Eve picture perfect—until the roads get bad. After lunch, the grandkids and I make a birthday cake for Jesus, then they get into their dressy clothes and we take family pictures. 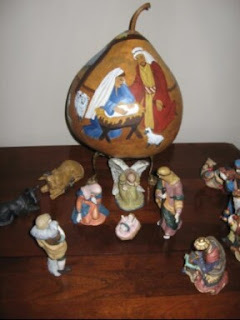 Our grandkids tell the Christmas story while moving the figures from the crèche. The children often put on a play of sorts and last year directed the actors—their parents and us—to reenact the story of Jesus’ birth. We play games with a favorite Christmas movie in the background. Around five o’clock, we gather around the dining room table set with Christmas dishes for our spaghetti dinner. For dessert we have Jesus’ birthday cake, angel food of course, with a big red candle in the center, and sing Happy Birthday to Him. After we clean up the kitchen, we open gifts. With ten of us opening one gift at a time, this takes a while. I order on line, but the bulk of gifts come from the mall. Our daughters and I get lots of shopping done on the Friday after Thanksgiving. The birth of our Savior. It’s not easy to keep the reason for the season in focus, especially with only one afternoon and evening crammed full of festivities. We focus on God’s greatest Gift to us by attending special programs and activities at church and by looking for ways to give to those in need. With little ones around, we talk about baby Jesus a lot. We start with brunch for those staying at our house. An egg bake, sweets, fruit and plenty of coffee. Our daughter’s family leaves for their in-laws after that. My husband and I have a lazy day then share the evening meal with a family-less couple like ourselves. Often steaks or pork tenderloin with rice or baked potatoes and a Christmas-y salad of Bibb and romaine lettuce, raspberries, feta, pecan halves and sliced pears drizzled with raspberry vinaigrette. One of our daughter’s provides the cookies. For us turkey is the centerpiece of Thanksgiving. We never have it at Christmas. We have tickets to the Living Christmas Tree and will attend Carols by Candlelight and an Angel Tree gift exchange with the children of prisoners at our church. We’ll go to two Christmas programs our grandchildren are in and will gather with friends. I was concerned that gifts, decorations, and festivities had swallowed up the reason we celebrate Christmas. It helped me to realize that when I remember Jesus birth and His death each day all year long, I can relax and enjoy my family and the fun surrounding this special time. Camy here: Thanks for sharing, Janet! She’s too modest to say, but Janet—as a debut novelist—was chosen one of the launch authors for Steeple Hill’s new Love Inspired Historical line! Her Golden Heart contest finalist entry, originally titled Orphaned Hearts, is now titled Courting Miss Adelaide and is coming out in September 2008. Thanks Janet, looking forward to your book coming out. i remember that excitement of jumping on my bed. I love your decorations too. the little village is so sweet. Thanks, Jenny! I remember another time I jumped on a bed. This time my cousins and I jumped on my grandmother's feather bed. I was twelve and wearing my grown-up velvet slim skirt my mother had made me. I split a seam. Talk about embarrassing!!!! Janet, your Christmas sound so lovely. Ours gets a little more crazy because we're both from big families and have four daughters. It keeps us rushing around, but I love to have a chance to spend time with family. My only regret is, that with so many of us, it's almost impossible to have a real conversation with anyone, one on one. I keep thinking when all the grand kids are grown it'll quiet down. My mom has 28 grandchildren, but they are getting grown up, 13 of them are out of high school now and about seven more are IN highschool, so now not quite such a kid-fest. More like wandering into a bad neighbor hood with cruising gang members. Mary, by the time your mom's grandkids are all grown, your lovely daughters will have some little ones to add to the fun. :-) A big family sounds like fun. My brothers and their kids aren't nearby. Sometimes I feel like an only child, like my husband. Tina, have you started decorating or do you wait until close to Christmas? Janet. i use to use my bed as a trapoline till they bought me a new one not so springy. Oh dear spliting the seam wouldn't been to good but it would have been fun. this year mum is into christmas! shes 88 and the past several shes been wanting it over cos its to much work or to much hassle to do things. (she really doesn't need to do them but works herself up and is a grouch) she also has alot of arthritis and other issues. This year she was excited when I got a new fake tree and decorated it ever put some things up herself and is really enjoying it this year which is wonderful cos i too Love Christmas. Our tree goes up early Dec depending on the weather. if its a heatwave we wait a little. but i start singing carols much earlier. Love the photos and insight into your life, Janet! Makes me want to pack my family up and come there. LOL! Janet, just got home from work, and your "Christmas" is the first thing I wanted to do! Geez Louise, it gets me in the mood for Christmas, which is saying something since I've been a bah-humbug girl the last few days!! Thanks for sharpening my focus. Loved the photos, Janet! Thanks for sharing them. Hi Janet. I started decorating, but you know, for some things I just went through the motions. Now I really want to just slow down and make it more meaningful. oh i am thinking tinsel in australia is different we call the long strips of pretty stuff you wrap round the tree tinsel, the other stuff you put one at at time on branches we call the icicles. Jenny, How wonderful your mother is having a good Christmas this year! God bless her and you for being such a great daughter. And you're right. They are called icicles! Thanks for the reminder. Cheryl, bring those precious little girls and your darling, hubby by! The more the merrier! Julie, Working, writing, and making Christmas is a loaded plate. That's enough to turn anyone into a scrooge. Praying things go smoothly for you. Thanks for stopping and Merry Christmas all!! !